The key to building a great children’s ministry is first building a great volunteer team. And that can be challenging. Here’s the good news. You can build a great volunteer team. And here’s how. With 2 asks. Check out this verse for the first ask. The first ask – ASK God to send you volunteers. In the verses above, Jesus brings our attention to those around us who need Him. He reminds us that there are many people that need to be reached. Kids. Moms. Dads. Grandparents. He then shows us that it takes workers…volunteers…to reach them. How will these workers be propelled into the harvest fields? By ASKING God to send them. Do you need more volunteers? Pray. Pray. Pray. Ask God each and every week to send you more volunteers. During your quiet time…ask God for volunteers. Ask some of the prayer warriors in your church to ask God for volunteers for children’s ministry. Every time you meet with your staff and volunteers…take time to ask God for more volunteers. When you are driving down the road…ask God for volunteers (with your eyes open, of course). When you are walking through the hallways of your ministry…ask God for more volunteers. When people ask how they can pray for your ministry…ask them to pray for more volunteers. How do I know God wants to give you more volunteers? Because He told you to ask for them. Jesus wouldn’t have told you to ask God for something, if it wasn’t something He wanted for you. God’s heart is full of compassion for kids and families who are hurting. Kids and families who have yet to experience His forgiveness and healing. He longs to have a relationship with them. You can be sure He will give you the volunteers you need to bring them to Him…if you simply ASK. There have been times when I moped around because I didn’t have enough volunteers. But looking back…it was because I was spending more time complaining about not having volunteers, than I was praying for volunteers. James 4:2 reminds us that “we have not, because we ASKnot.” If you need more volunteers, then spend more time asking God for them. And when you ask…take your prayers to a deeper level. Ask God to send you to divine appointments. You see, I believe there are people in your church that God is already dealing with about serving in children’s ministry. They are simply waiting to be asked. How do you find them? ASK God to lead you to them. When you find a divine appointment, the person will say “yes” when you ask them to serve. That’s what you are looking for. Divine appointments. They come again by asking God for them. That’s the first ask. Here is the second ask. It’s found in Matthew 9. The second ask is PERSONALLY ASKING PEOPLE TO VOLUNTEER. Notice what Jesus did. He approached Matthew and made a personal ask. This is how you build a volunteer team. Asking people, one at a time, to join you. Week in and week out. Approach people (divine appointments) and make the ask. I remember when we made a list of all of the volunteer ministry positions we needed. It was our dream list…if we could have all the volunteers we’d ever need. We turned the list into posters. There was a poster for guest services, a poster for nursery, a poster for preschool, a poster for elementary, a poster for pre-teen, a poster for special events, etc. Each vacant volunteer role was represented by a sticky note on the poster. There were a lot of sticky notes on those posters. Each week we would pray over those sticky notes. Each week we would ask people…one at a time…to join the team. And God begin to fill up those sticky notes. In 8 years, the volunteer team grew from 300 to 2,600. How did it happen? One prayer at a time…one personal ask at a time. Here’s what you’ve got to remember. It takes BOTH ASKS to build a volunteer team. 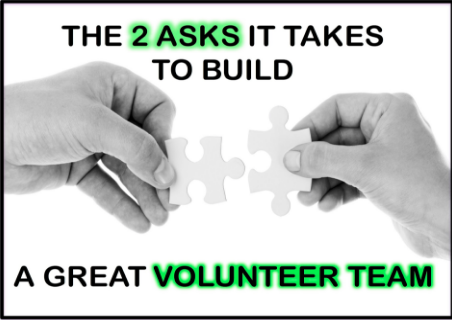 If you will leverage the power of the 2 asks, you will build a great volunteer team. You can get more insight about building a great volunteer team in my book “The Formula for Building Great Volunteer Teams.” It is available at this link.